(Niamey) – CowaterSogema, along with partner Centre d’Étude et de Coopération Internationale (CECI), have launched their activities as part of the Millennium Challenge Account Niger (MCA-Niger) project sub-activity Agricultural Support Services (SAA). This project is part of the broader Millenium Challenge Corporation USD 437 million compact with the Government of Niger addressing access to water for agriculture and livestock, and trade barriers. Following a competitive selection process, CowaterSogema and CECI were selected to implement this CAD 9.86-million-dollar project by MCA-Niger. The SAA project will run for 4 years in two phases and was designed and financed by MCA-Niger. The project aims to increase the productivity and profitability of agricultural activities by providing technical assistance to producers and their organisations. Through this program, participants will be able to improve their technical knowledge of agriculture, improve access to production, storage and marketing services, and increase the sale of commodities and processed products as well as gain basic literacy skills. In addition to these main goals, the program aims to strengthen the capacities of grassroots producer organizations, including specialized cooperatives, savings and credit groups and other individuals and organizations in and around the project area. The SAA project will be implemented in two regions of Niger – Konni and Sia Kouanza – covering a 5,000-ha area and reach approximately 17,500 persons with a special focus on women and young people. 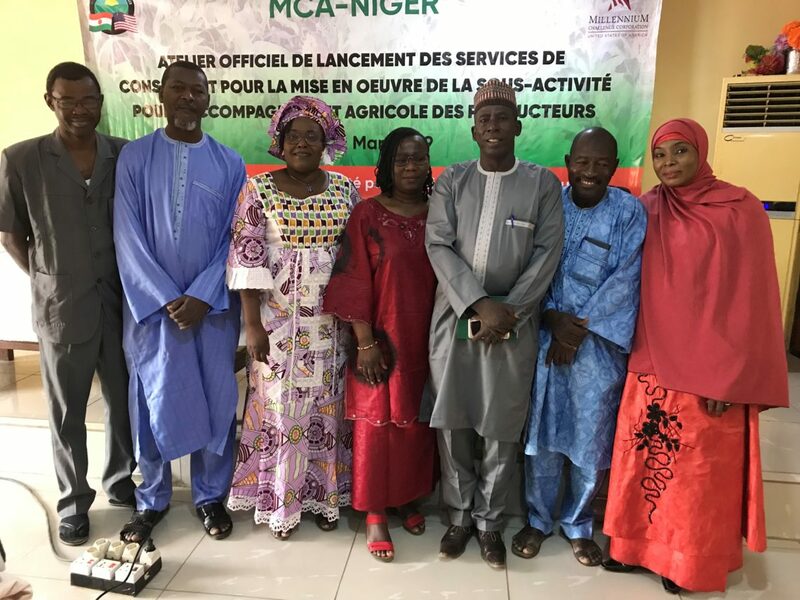 MCA-Niger Director M. Mamane chaired the launch in Niamey on March 4th, 2019 which was attended by MCA-Niger Staff, the national technical services and others MCA-Niger Consultants. It was an opportunity for CowaterSogema/CECI to present their mandate and methodological approach. Following the event, MCA-Niger held two launch workshops in Gaya and in Konni to introduce CowaterSogema/CECI to the local authorities, technical services, other stakeholders and the beneficiaries. This project is expected to increase the revenues of producers, women and young people through technical assistance to improve literacy, agricultural production techniques, access to finance and marketing, and management capacity.